In the old Mystery cultures the human being experienced himself as a child of the gods, or even an instrument of them. According to Rudolf Steiner's spiritual-scientific research, the birth of independent thinking came only with our present state of consciousness - through becoming aware of the individual self. But who is this self? Who am I? Virginia Sease and Manfred Schmidt-Brabant maintain that real self-knowledge is intimately connected with knowledge of the central being of world evolution: the Christ, or the 'I AM'. 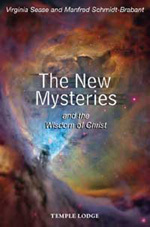 Focusing on the being of Christ and on Christianity, The New Mysteries presents a series of engaging lectures on the developing Mystery wisdom of our age. Having given an overview of the history of the Mysteries in their book Paths of the Christian Mysteries, the authors deepen and further their study by paying special attention to the effect of the Christ Mysteries. Among the essential themes of this new volume are the transformation of conscience, the place of prayer and meditation, and the significance of sacrifice today. VIRGINIA SEASE was born in the United States. Her study of German literature led to a PhD from the University of Southern California in 1969. She has been a member of the Executive Council of the General Anthroposophical Society since 1984, and served from 1991 to 2001 as leader of the Section for the Arts of Eurythmy, Speech, Drama and Music of the School of Spiritual Science at the Goetheanum in Dornach (Switzerland). Her current responsibilities include liaising between the Executive Council and English-speaking anthroposophists around the world, and directing the English Anthroposophical Studies Programme at the Goetheanum. MANFRED SCHMIDT-BRABANT was born in Berlin, Germany. He became a member of the Executive Council of the General Anthroposophical Society at the Goetheanum in 1975 and served as Chair of the Council from 1984 until his death in 2001. His service during those years included leadership of the Social Science Section of the School of Spiritual Science, and lecturing around the world on many subjects. English editions of his books include Paths of the Christian Mysteries and The Archetypal Feminine (with Virginia Sease), and The Spiritual Tasks of the Homemaker.